On the river, Volpe leads for 170,000, and Stockfish calls. Volpe fans out for trip eights, and Stockfish folds. Four hands later, Stockfish raises the button to 50,000, and Volpe calls. 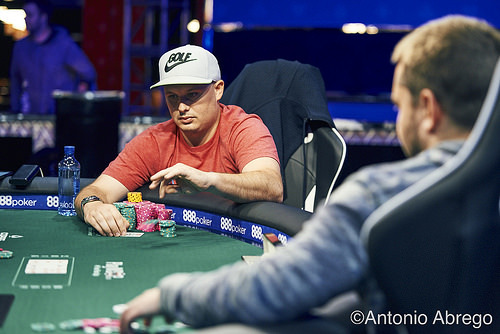 Volpe check-calls a 65,000 bet on a flop. On the turn, Volpe checks, and Stockfish checks behind. Volpe fires 175,000 on the river, sending Stockfish in the tank. Eventually, he calls, but Volpe has it again and tables for trip fours. Stockfish mucks.